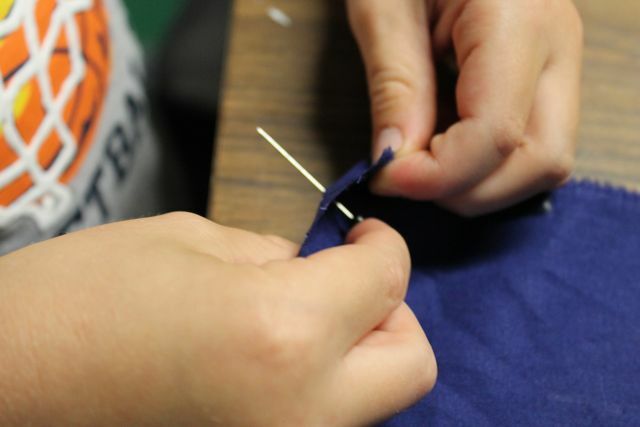 Many years ago, while a senior in college, I designed a bulletin board with my wife for a display in the Education Department that read, "Teachers Make 10,000 Decisions Every Day." I do not remember where we found the quote or what was on the rest of the display, however, that quote has always stuck with me. 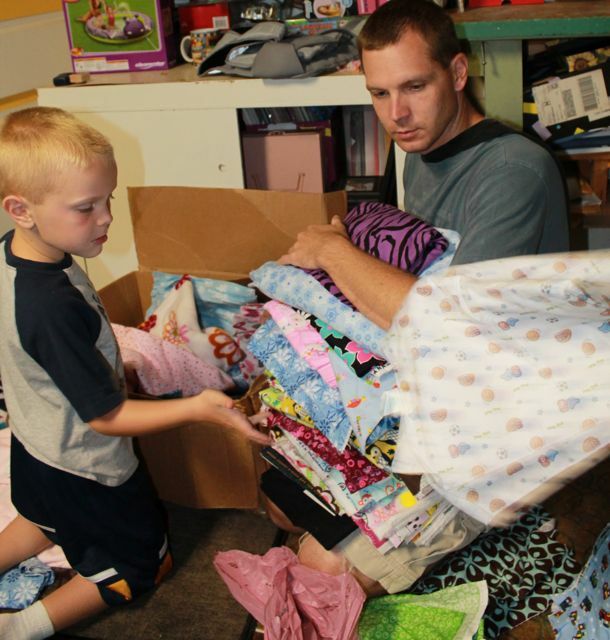 Now, more than 10 years, and 4 kids of our own later, I can't help thinking about moms and dads of young children. We must make 10,000 decisions by lunch time! It is no wonder that exhaustion sets in well before one of the most important times of the day at our house, bedtime. At bedtime, we feel it is so important to bring a positive closure to the day and provide excitement for the day to come, but sometimes it is so hard. Just this week, one night before bedtime, I was falling asleep while trying to find all the items in one of Walter Wick's Can You See What I See? 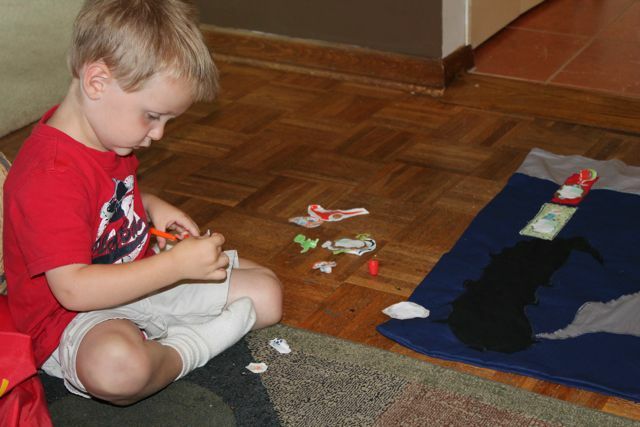 picture puzzles. My boys nudged me in the shoulder and said, "Stop falling asleep, Dad!" (Unfortunately, this happened more than once!) Luckily, also this week I stumbled on a little piece of wisdom from Sherri Duskey Rinker, a mom who knows the importance of bedtime, "Have some coffee after dinner so you're awake to read 'just one more'." (Huffington Post). I always have my coffee after they go to bed. I might be changing that routine after this week! 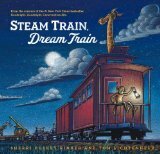 Sherri Duskey Rinker is a mom and the author of two New York Times Bestselling books, Goodnight, Goodnight, Construction Site and Steam Train, Dream Train. Her website states, "I create books out of love, inspired by the children I love." 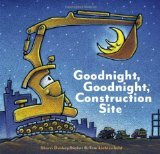 It was her youngest son, Zak, a lover of trucks and heavy machinery, who inspired Goodnight, Goodnight, Construction Site. "Long before GGCS was an actual book, we would lie together in the dark and imagine all of those big, hard-working trucks slowing down and falling asleep." (Chronicle Books). 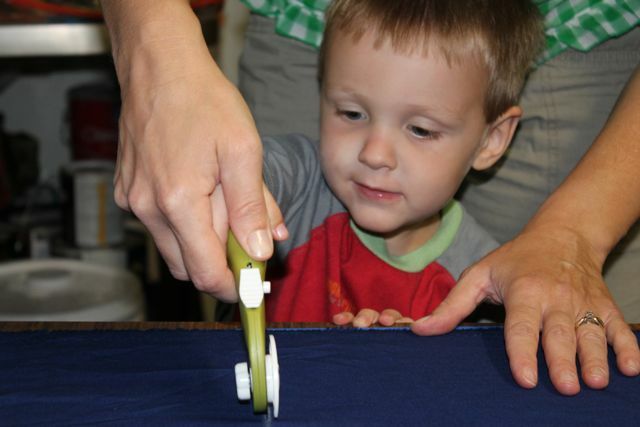 Rinker, someone who has always "devoured poetry," wrote a manuscript for a picture book about the trucks that her son loved with the intentions of giving exhausted moms and dads what they so desperately need -- a relaxing, positive, and enjoyable bedtime together with their child. (Mazza Museum Keynote). It was a genius idea that she believed in and she sent her manuscript to Chronicle Books who later discovered it from the "slush pile." After two long years of revisions and Tom Lichtenheld being chosen as the illustrator, the book became a huge success! 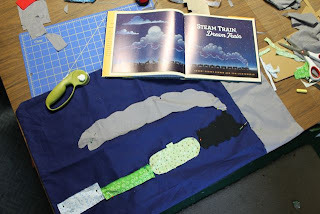 Her next book, Steam Train, Dream Train was released April 2013 and debuted at #1 on the New York Times Best Seller list. (Chronicle Books). In this book, Sherri's mom-instincts paid off once again, "My kids were always fascinated by the different kinds of train cars and the different kinds of cargo they each carried. 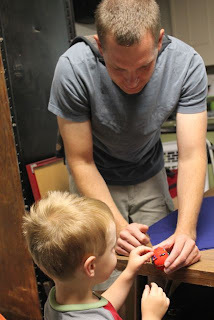 I was intrigued with the idea of taking those non-fiction aspects and combining them with the kind of cargo that my sons would love: ice cream, toys, bikes, blocks, dinosaurs, etc." (Redeemed Reader). Both Goodnight, Goodnight, Construction Site and Steam Train, Dream Train are books that are enjoyable to read aloud (at anytime, not just at bedtime) and should be a part of every young child's home library. While I was at the Mazza Museum Summer Conference two weeks ago, I asked Sherri Duskey Rinker to sign a copy of Steam Train, Dream Train for three very cool, book-loving boys that are friends of our family. I thought this book would be the perfect gift for a family that loves to read together. As Sherri was signing the book I asked her if she would share her birthday. After finding out that it was early in August my mind immediately started to think about a way to bring the book to life. Initial thoughts and ideas involved visiting an old steam train or taking a train ride in the evening. Later, during Sherri's keynote speech, she expressed how much she loved reading books to her boys at bedtime. 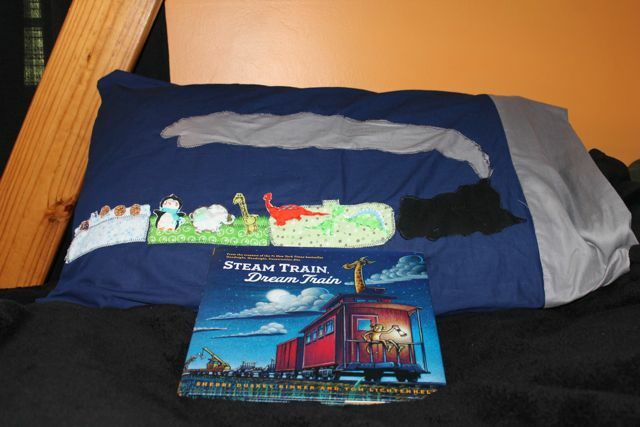 I kept saying over and over in my head, "Bedtime and books....bedtime, books, and trains....bedtime." Then, I had a fun idea. (At least I thought it sounded like a fun idea.) 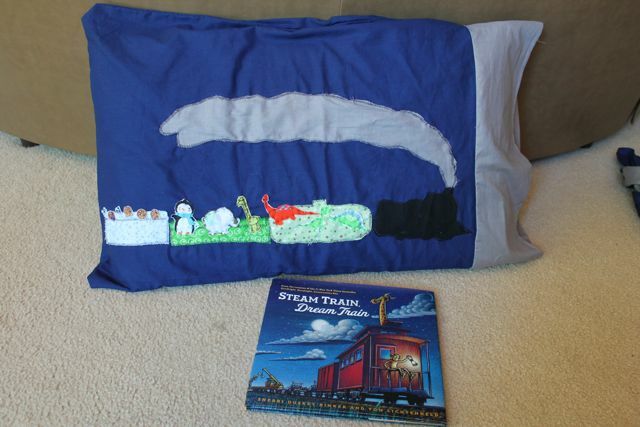 We could make pillow cases inspired by Steam Train, Dream Train and pair them with the signed book to make the perfect gift for our friends! To make this happen I needed help. I called my wife from the conference and said, "When I get home do you think you could help me make pillowcases with the kids?" 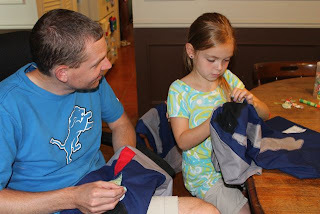 She happily agreed to help with the sewing, just like she has with many of my other crazy ideas. 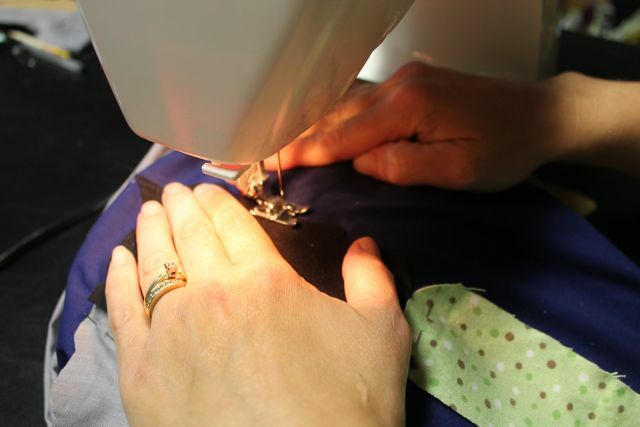 My wife is not a seamstress by any means, but we had a lot of fabric at home from other projects. We needed dark-blue fabric to create a dreamy night scene just like Steam Train, Dream Train. After searching through the pile of what we had already, we realized what was in the house was not quite what we needed. We went to the fabric store and the boys picked out the cotton fabric that they thought was perfect for their pillowcases. 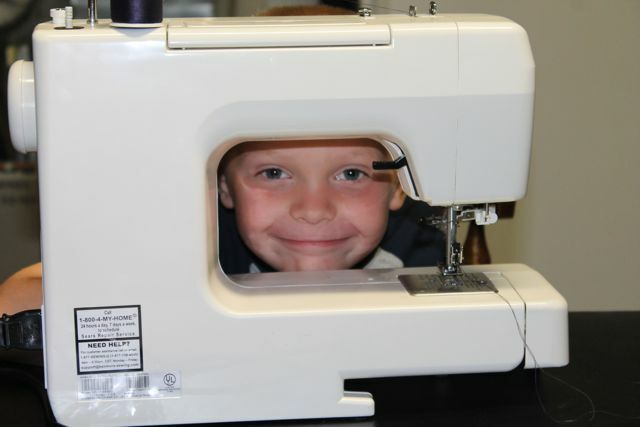 My oldest son was pretty excited that he was going to get to use mom's sewing machine! 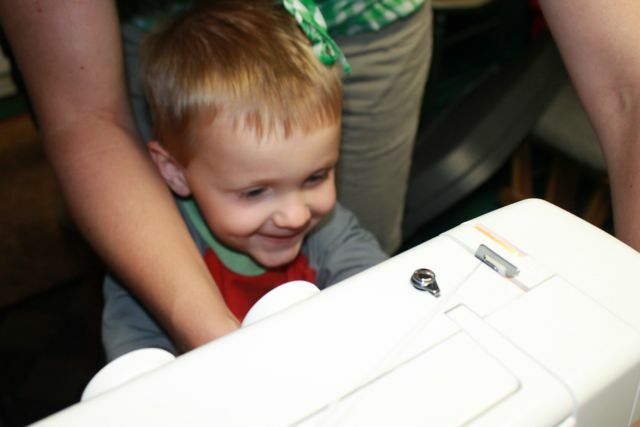 He checked out all the buttons, switches, and knobs while Mom and I prepared the work space. We used measurements and instructions from Etcetorize. 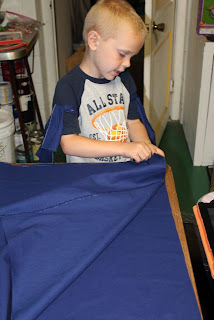 Their blog post was titled "Super Pretty, Super Easy Pillowcases" and I would agree that this project was relatively simple, but I only can say that because my wife guided us along the way. 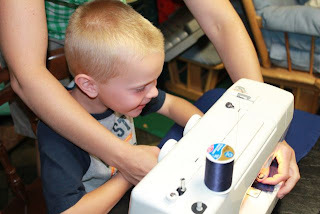 The boys were involved with each step of the process and they surprised us with their ability to do tasks like folding and pinning. We escaped with no major pricking accidents! 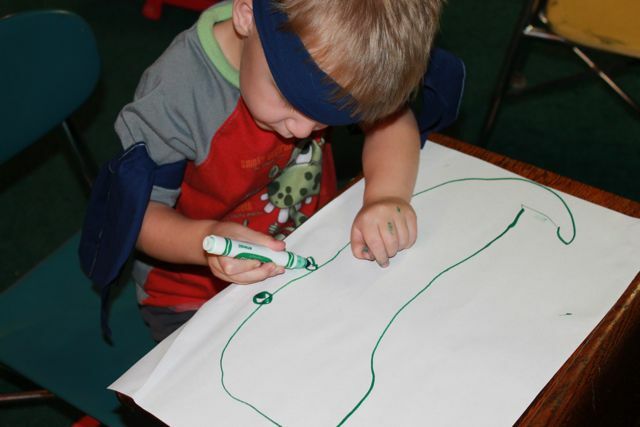 My son had me wear a super hero cape for this activity. He should have been the one wearing it, because he was so brave working with the pins. He felt pure joy when he used the sewing machine for the first time. 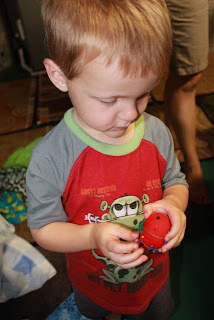 He called the pincushion his "whoopee cushion"! 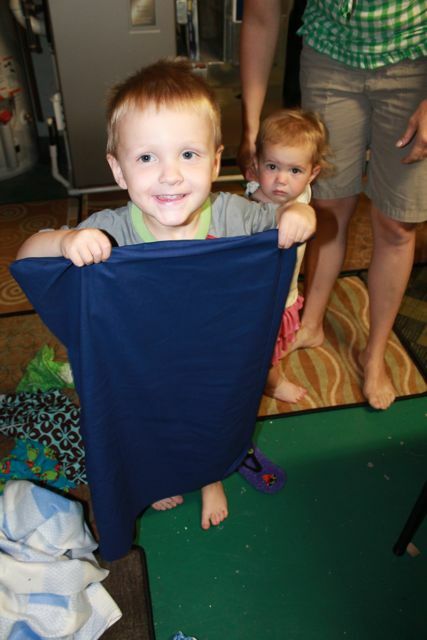 I loved seeing his excitement too! "I did it! 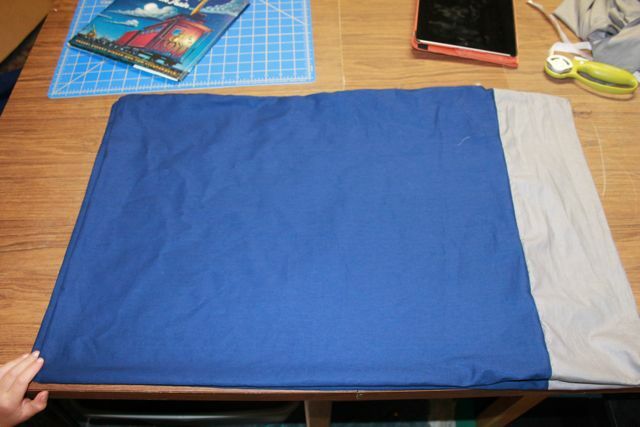 I made a pillow case!" We added a decorative band to the pillow case too. 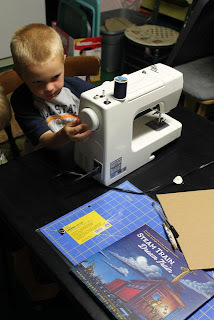 This gave the boys another chance to use the sewing machine. The pillowcases were made and it was time to turn them into Steam Train, Dream Train pillowcases. My son and I looked through all of our fabric to find animals, dinosaurs, and toys that we could use as cargo for the trains. We found the animals and toys that we needed but we still needed trains to put them in. My son drew a train on a piece of cardboard. He used Tom Lichtenheld's illustration as a model. 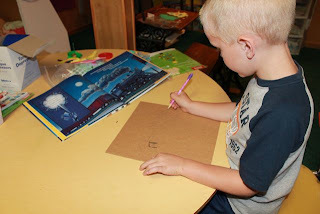 My youngest son drew a train too. He said, "It's a dog train. It has a tail." 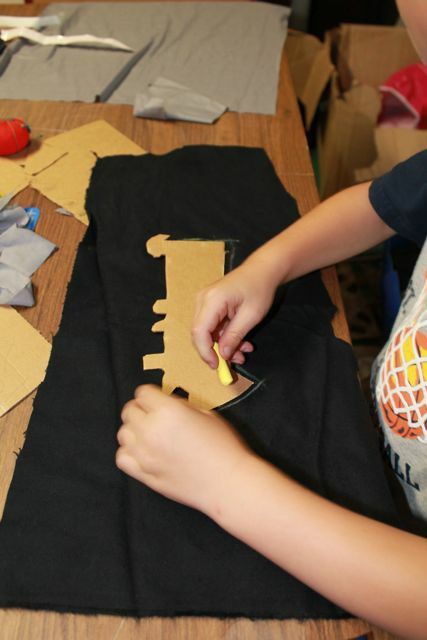 We cut out the drawings of the trains and traced them onto a black piece of fabric using chalk. 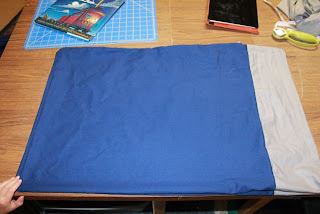 Gray fabric was used to create the steam. After selecting a few fun fabrics for our tank car, well car, and hopper car we pinned everything onto the fabric. 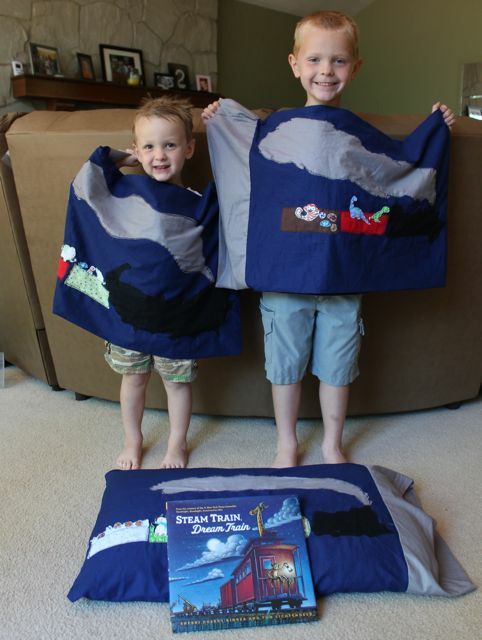 Mom stitched the train to the pillowcase. Next, we cut out the animals and toys from the fabric that we found in the basement. After a quick lesson, he tried hand stitching for the first time. 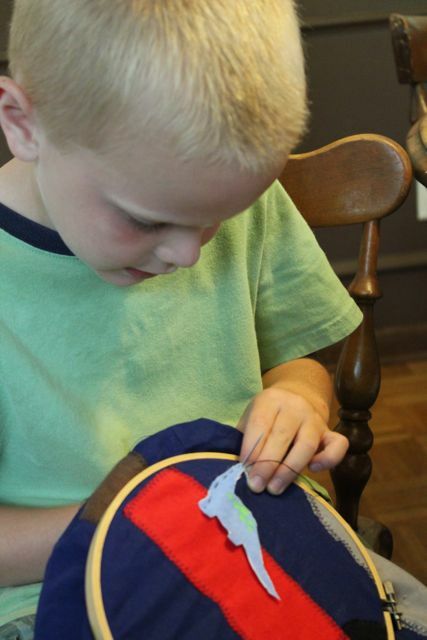 He was so proud that he stitched the whole dinosaur! My daughter came home from theatre camp and we sewed together until the project was complete. I don't think bedtime could get any better! The boys were very proud of their work. They can't wait to give their gift to their friends! 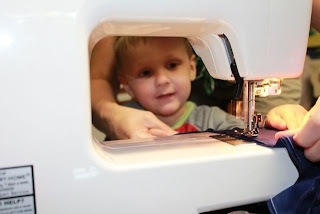 If you are on Pinterest, I would love it if you pinned this picture! Look for Sherri Duskey Rinker's next book Since There Was You in 2015. 3. 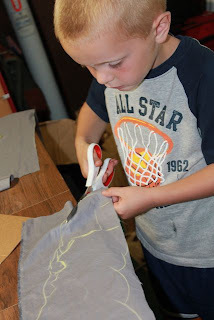 Goodnight Goodnight Construction Site Free Printables!